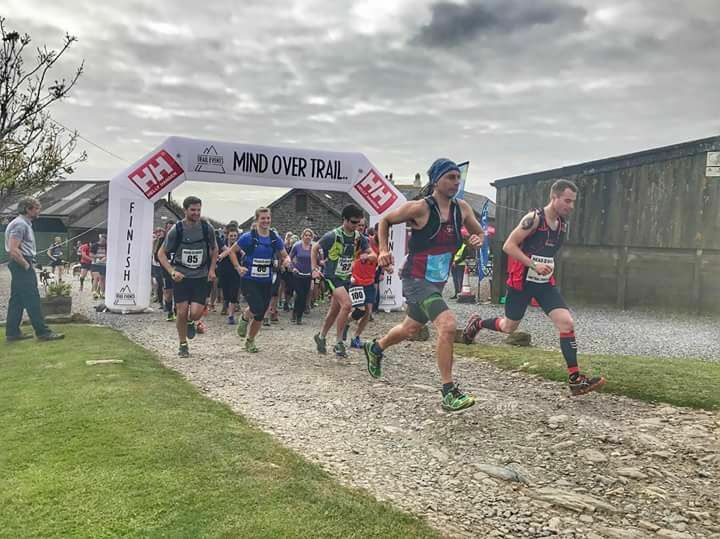 Fresh from his brilliant run at Manchester marathon where he achieved a good for age place for London 2018 (time: 3 hours 3 minutes) James Brydon’s next challenge was the Head II Head, a half marathon trail and coast path run set in the South Hams near Salcombe. Running in his second-claim Mud Crew club colours, James took the lead right from the start and didn’t relinquish it, finishing in first place with a time of 1:29:43. Given the challenging nature of the terrain on this course, this was a truly remarkable achievement. James seems to go from strength to strength and is one of Bodmin Road Runners young stars. This race has been going for many years and is part of the Saltash May Festival. It was hotly contested in previous years. The old start/finish was at the bottom of Fore St and it made for a great spectacle with plenty of spectators lining the road. Now however, the race is run from the football club at the top of the town which detracts for the atmosphere. Also, the course is different with the first couple of miles around housing estates (familiar to those who do the Mag 7). The race only gets going on reaching Forder at 3.5 miles. Unfortunately, here there is a BIG hill and many were down to a walking pace. From here it’s up and down with a climb out of Forder once more on the return leg. The weather was dreadful – very wet throughout and breezy in places. This made for unpleasant running and I for one just wanted to “get it over with” – not a good attitude! There is a loop at Trematon so those of us not-so-quick people saw the lead runners coming back. Their pace was to be dreamed of. The winner, Steve Osborne, finished in 1.16.58, which is a very good time considering the hills. The lead lady was Debbie Starkey from St. Austell RC. She finished in 1.34.27. Astonishingly, the second Lady was Jenny Mills from Launceston who came in in 1.42.18. Jenny is over 60! The BRR star today was Rachael Wilsher who, agonisingly came home a few second over the two hours in 2.00.19. I saw at the end of the Trematon loop, looking strong and running well. Rachael said that she expected me to catch her – no chance! Rachael was third in her age group. Well done Rachael. I had a very unsatisfying run. Wore the wrong clothes and was cold in the rain. Had two pit stops, an abdominal pain and moaned to myself all the way around. Bad attitude! I finished in the perambulate time of 2.06.38. However, I was second in my age group (out of 7 in case you are wondering). So, a bit of a compensation but a race to forget. There were 134 runners and praise must go to the marshals and other helpers for standing out in the rain. Thanks Tamar Trotters. The last time I did this race, it was 2015 and the weather was absolutely gorgeous! I had sold it to my running pals as a beautiful, bluebell full, woodland trail type of an event. We headed up to North Devon, Jackie, James, Trish, Sarah Hill and me. Somewhere on the A39 were Becky, Stef and Rob. The weather couldn’t have been any more different this year, the 5th running of this race. It is organised by North Devon Road Runners and is a fun filled event. Registration and race start are in the stunning surroundings of Hartland Abbey. It’s always lovely to catch up with friends from all over at this race. The Heartbreaker is 18 ish miles long, the 9mile Heartache, its smaller sibling. During the briefing, it is explained that if you get to half way and can’t continue, “if you want to go crying to mummy, if you want to take the walk of shame” you can finish there but don’t take a medal until all the genuine 9 milers are back! I don’t know if anyone did! The race itself is a mixture of woodland trail, fields, country lanes, coastpath. It’s brutal! There is no other word for this one. The downhills kill your quads, the uphills kill everything! There was SO much mud this year! What should have been a lovely, runable woodland section had you hanging onto trees for dear life to stop yourself sliding into an abyss! The coastpath was hilly and wet and windy. There were steps! There were muddy banks, there were 2 ropes that made a hill climb almost possible! Oh, there were bluebells! Bluebells that even put Lanhydrock into the shade! The route is dotted with signs, “Heartbreak”, “Heartache”, “The Wall”, “The Edge” to name a few. There were water stations but there were alcohol stations! Vodka, Prosecco and Sangria! Sarah had something at all of them! We did partake in a Prosecco toast. It’s lovely, it really is. It’s worth the trip, if only once, as it’s a great, quirky, slightly bonkers event. 5 runners were taking part having run every 18 miler since it’s inception and were given various fancy dress costumes by the race director and instructed to start and finish wearing them. The star of our group was, unsurprisingly, James Brydon. This is yet another race designed with our James in mind! He really is going from strength to strength and the trails are his natural territory (in my humble opinion)! Next home were Becky and Stef who are proof that training is a really good idea! They flew round and it was lovely to see them and James waiting for us at the finish. I ran with Jackie, Pat and Sarah (Newquay RR) and as always am eternally grateful for Jackie and Pats support! They really do drag me round but we do love doing these sort of events together. James, 2hrs 50ish. 8th PLACE!! Jane, Jackie, Pat & Sarah, 4hrs 15ish. Rob. Shortly after us! Sorry Rob, I’ll post times when they are out! On Monday 1st May, the public ballot for the 2018 London Marathon will open. Runners have until 5pm on Friday 5th May to put their name in and be in with a chance of getting a ballot (non-charity) place. There is no maximum limit on the number of entrants, so you can do this at point during this period. You are then told in October whether you have been successful. 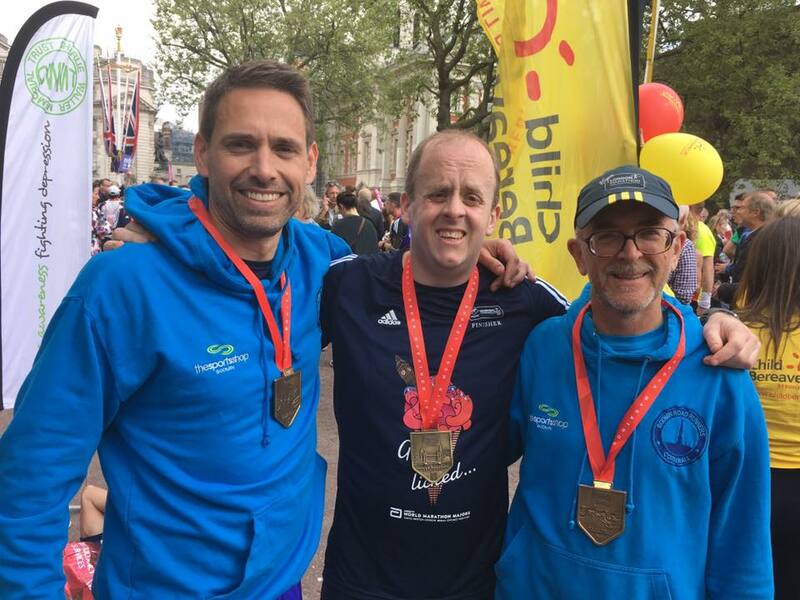 For those who aren’t aware, each running club is also allocated a number of London Marathon places to be given to their members; we have one place allocated to us as we have less than 100 members. In previous years, we have decided this by having everyone who is interested put their name in a hat and choosing one at random at the Christmas party. The winner then pays their own entry fee. However, with the club growing so much in number (and distance ambition!) 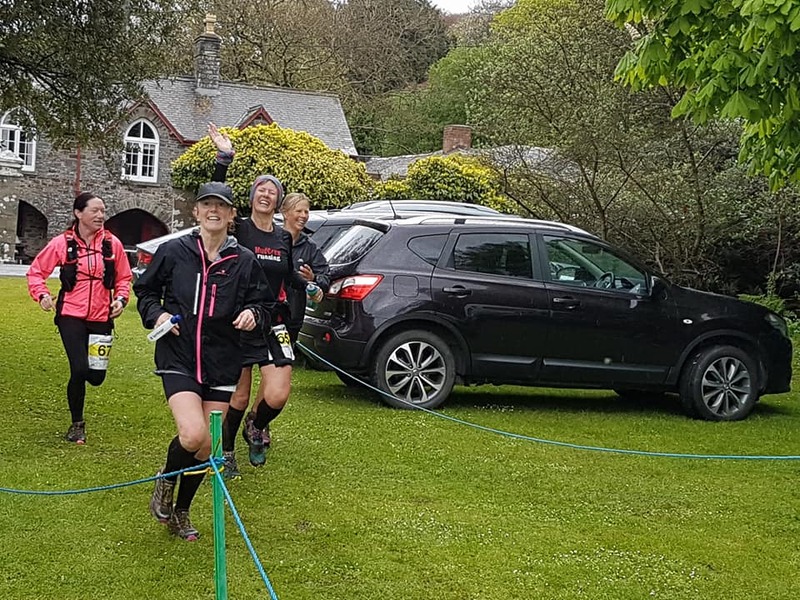 recently, we thought it was time to follow suit of other local clubs and put some requirements in place to make sure the winner is someone who has reliably shown an interest and is committed to running the race. Have entered and been unsuccessful in the public ballot. The results of the ballot are sent out in October, so this means you just need to send me proof of your rejection (letter/email) when you get it and we can put you in the draw. This will then be drawn at random as usual, at the earlier time of October to allow the lucky winner to start planning their training! 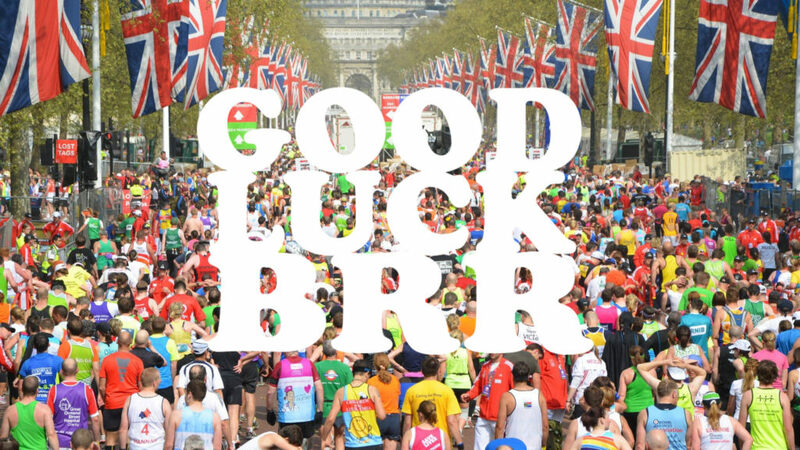 In short – Make sure you enter the public ballot next week if you would like to be in with a chance of getting a place through BRR! Hope that’s ok with everyone. Any questions, let one of the committee know. Congratulations to all BRR members who completed the London Marathon! East Cornwall Harriers’ 5 Tors Race is the only proper fell race west of Dartmoor. It has been going for well over 30 years and was originally organised by the residents of Common Moor to raise funds for the village. The route was different then – it started and finished at Siblyback and was four miles longer. ECH took it over and moved the start/finish to Minions and eventually changed the route to make the course more obvious from the tors perspective. Now 8.5 miles and, surprisingly, not that hilly. There are climbs up Stowe’s Hill and Kilmar, but otherwise gently up and down. 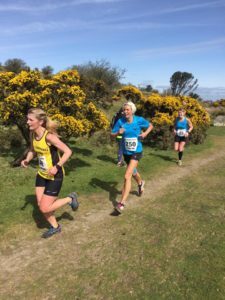 April on the moor can be blazing hot or snow, but Sunday’s run was about as good as it gets – a chilly breeze to start but sunny and surprisingly warm toward the end. The going was dry underfoot which made for quick times; seven men were in under the hour with Dan Nash of Cardiff AC coming in at 53.37. Dan is at university in Cardiff but is a local boy and came up through the junior ranks of ECH. The first lady in was a visitor from Bristol AC, Lucy Macalister who was home in 1.01. (Ian asked her about her time and she said she didn’t know as she never runs with a watch – hmm). There were 14 BRRs out for the race and trophies were had by some: After some doubts about competing, Pam Solomon had a blinder and was second in her age-group. Also, doubting his abilities after the Parkrun on Saturday, was John Tilley, second in his AG; and Ian Ringer 1st in his. So, good results for the club. The undoubted stars though were Phil Dawber who came in 18th place and James Brydon 21st. Both had good runs and deserve great praise. Well done boys. A trio of BRR ladies finished together which must have been a sight to see: Pam, Gail and Jackie all come home together in 1.21.55, an excellent result for the club. A special mention should be made of Zoe Buse who braved the tricky off-road course prior to the London Marathon. She came away unscathed and lives to tread the capital’s roads. Finally, it was great to see Paula Osborne taking part. Well done Paula. A few thanks: Firstly, to Martin Morgan who, as you know, had a nasty accident at this race last year. Martin played safe and did the essential number checking for the race organisers. Thanks Martin, an important task. Secondly to Jackie and those who brought cake for the coffee and tea. Most welcome after a thirsty race, and it is so good to have that social element where there is time to chat and compare stories. Lastly to Annie, Andrew and Phil’s dad for your support, always appreciated. Cornwall Search and Rescue were out in force and it is always reassuring to know that if one keels over they will be there to scrape one off the rocks. It was a record turn-out for the race – 267 finishers! Many thanks to ECH for a great event. The next MTRS race is the Imerys Half Marathon, very often hot and dusty, but a very good race. Have a go, or do the marathon! There are four race left in the MTRS. Competition is hotting up.